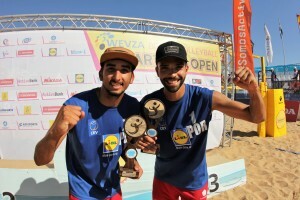 in the WEVZA’s Beach Volleyball Tournament that took place in Praia da Rosa Branca, Quarteira, in Algarve. won the final match against the Spanish team Saucedo/Aballe por 2-1 (21-8, 13-21 e 15-12). very carefully that match and that made the difference. into the 3rd and decisive set. and give our best. We are now focused in the final of National Beach Volleyball Championship – ActivoBank”. 15-13) and clinched the gold medal. João Pedrosa/Hugo Campos by 2-0 (21-15 and 21-16). Jardim, but we never gave up and kept our heads down and kept working. for us it’s always an honour to represent our country at international level”. Jardim, in the Women’s competition.